SKU: N/A. Categories: SCA, Knight's Chains. In the Society of Creative Anachronism, members of the Order of Chivalry are known as Knights. Entry into this Order is awarded to those who excel in armored combat on the field and demonstrate courtesy and chivalry both on the field and off. The regalia worn by a Knight of the SCA are a white belt, spurs, and a Chain of Fealty, often known as a Knight’s chain. This chain represents the Knight’s oath of fealty to the Crown of his or her kingdom. It is sometimes traditional for a Knight to pass on individual links of a Chains of Fealty as tokens of esteem or in honor of valiant deeds. This 36” Knight’s chain is composed of individually cast bronze links. 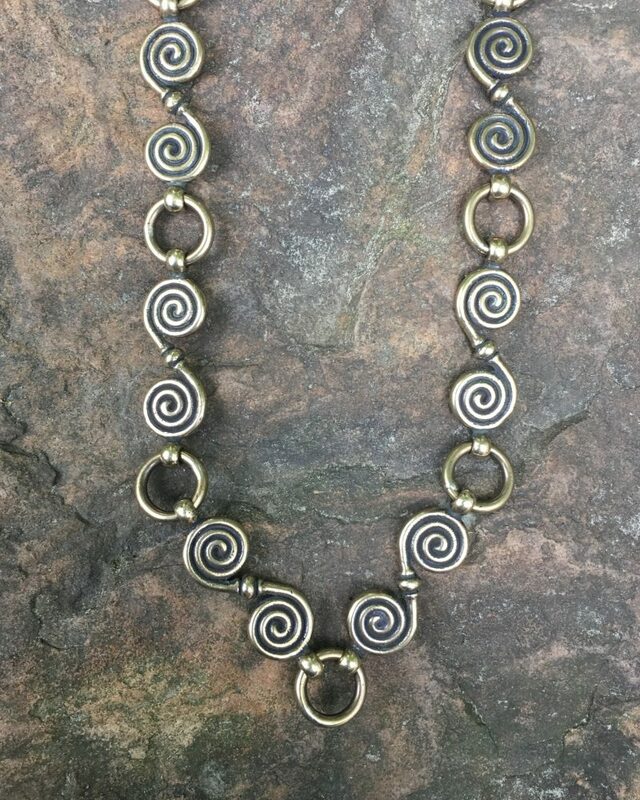 This spiral links of this chain make it idea for an early time period.